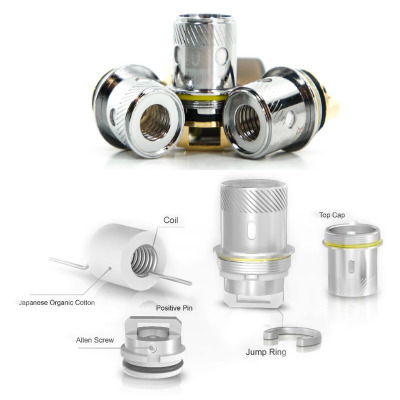 The Uwell Rafale Sub Ohm Tank is the improved version of the highly popular Tank. 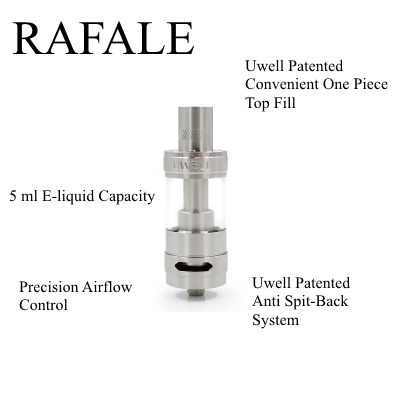 A new and stronger quartz glass tank is used in the Rafale to ensure durability and holds up to 5ml of e-juice. Uwell has designed a patented top fill system to make refilling easier, but bottom filling is also an alternative option. The Rafale also has a highly effective anti-spit back system inside the chimney to ensure you get a satisfying vape when using the dual parallel coil heads that can handle up to 120W of power. Patented top fill design, bottom fill capability. SUS316 surgical grade parallel coil structure. Reinforced 5ml quartz glass tank. Dual Precision Cut Adjustable Airflow Control. Stainless steel wide bore 510 drip tip (cannot be replaced). 0.2 ohm Parallel 316 Stainless Steel Coil Structure (pre-installed). 0.5 ohm Parallel 316 Coil Structure.